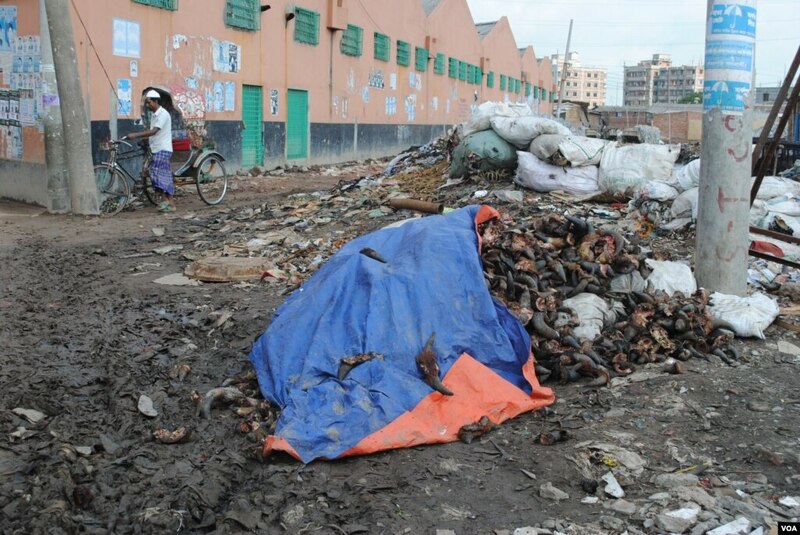 DHAKA— Amid rows of low buildings in this corner of Dhaka, the stench of flesh hangs in the air. 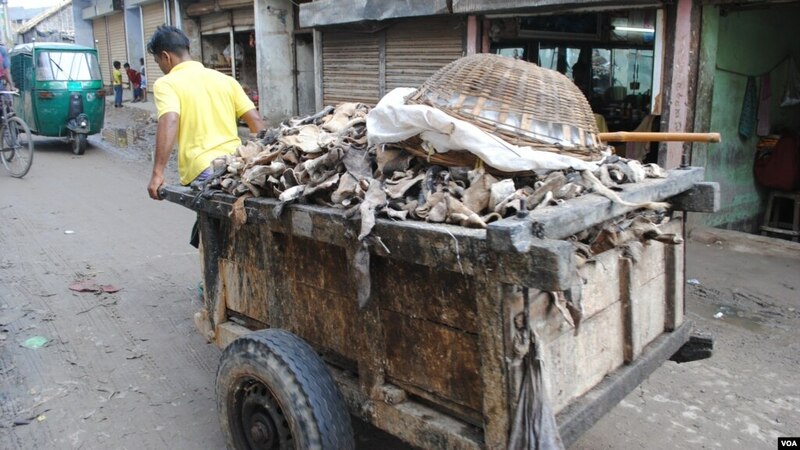 On the street, a man pushes a wooden cart piled high with fresh cow hides. Gutters are clogged with sickly blue water and clumps of animal skins. Flies gather on cattle horns piled on the ground to dry in the sun. This is Hazaribagh, a residential district that is also home to 90 percent of Bangladesh’s tanneries. 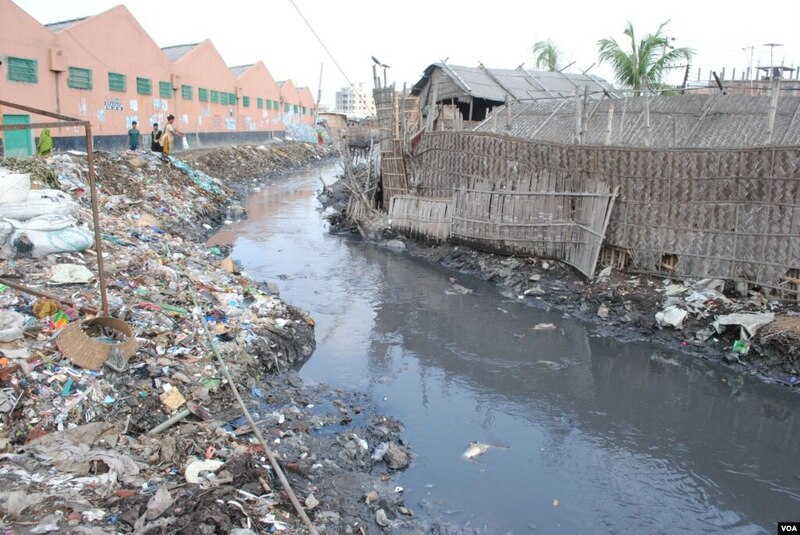 The area is infamous as an environmental and health disaster, with the waste from chemicals used for treating leather dumped untreated into streams that lead to the Buriganga River. Workers handling the chemicals and heavy machinery often have no protective clothing or gear. Muhammad Abul Bashar, 55, has worked in Hazaribagh’s tanneries for 25 years making wet-blue leather tanned with chromium. He knows chemicals and fumes used in tanneries cause diseases. “Workers are at health risk, but owners don’t look after us properly,” he said. 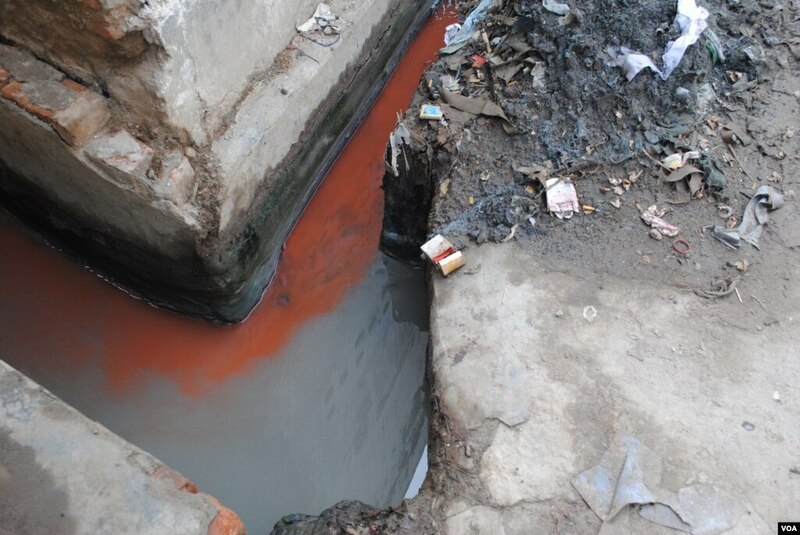 Human Rights Watch has warned of toxic conditions in Hazaribagh for both workers and residents. Pressure to modernize the industry came to a head in 2015, when it seemed that long-discussed plans to relocate tanneries to a modern facility called Tannery Estate Dhaka in Savar — a sprawling industrial suburb about 20 kilometers away — would be realized. But the relocation initiative missed multiple deadlines. Resistant owners have demanded low-interest loans and other financial incentives to move and upgrade. In addition, a modern effluent treatment plant, under construction since 2013, that is a cornerstone of the new tannery zone has yet to be completed. Now some groups are taking more stringent measures. 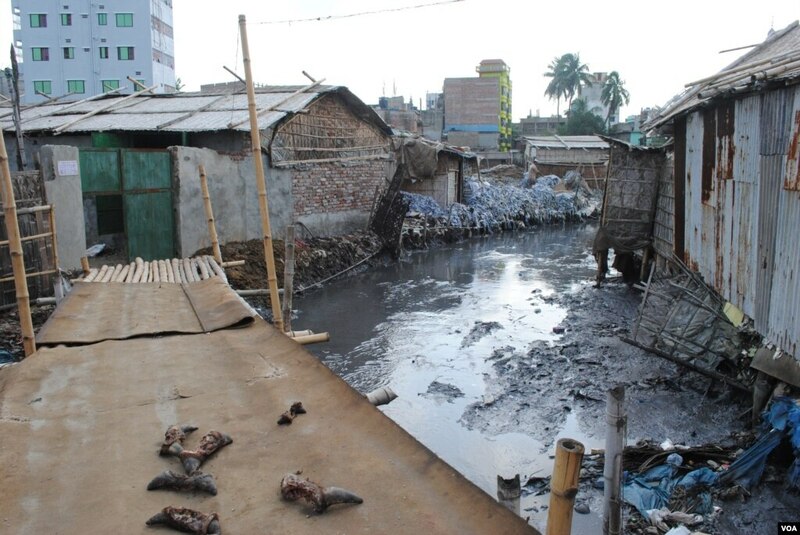 Human Rights and Peace for Bangladesh, a nongovernmental organization, last week filed another court petition against tannery owners who have not moved out of Hazaribagh. Bangladesh’s High Court on Thursday ordered a daily fine of 50,000 taka ($635) for 154 tanneries, out of about 220, that have not relocated to the new zone. The court called for Bangladesh’s industries secretary to submit a report on the tanneries by July 17, according to HRPB lawyer Manzill Murshid. The court also ordered the environment secretary to submit a report on the daily environmental damage caused by the tanneries. “Hazaribagh is in a very grim situation. For the last 25 years, no one has invested in Hazaribagh. It needs to be shut down as soon as possible,” said Syed Nasim Manzur, former president of the Leather Goods Footwear Manufacturers Exporting Association of Bangladesh and managing director of footwear company Apex. The push to modernize Bangladesh’s $1 billion leather industry, which provides income for some 30,000 families, is not just domestic. European and North American leather buyers are under increasing pressure to adhere to international environmental standards for leather-making. Many Western buyers are, in theory, barred from purchasing leather made in Bangladesh, and can only assemble leather goods there, although regulatory enforcement and product traceability remains problematic. Exporting to China, India and other countries where regulations are more lax remains permissible. And for Bangladeshi workers, it would be part of a much-needed improvement to job conditions. Thousands of the nation’s export garment factories are in the midst of upgrading to international safety standards by 2018. The plan was set in motion in 2013, after 1,100 workers died in the collapse of Rana Plaza, the world’s deadliest garment factory disaster.